Properties in Southeast Colorado Springs average 4.7 out of 5 stars. Property 7: 2 Bedroom Apt 1 blk from Golf Course & minutes from attractions. Property 13: Amazing home with mountain view near Broadmoor World Arena & attractions! Cozy furnished studio with all the amenities near World Arena & Ft. Carson! Property 14: Cozy furnished studio with all the amenities near World Arena & Ft. Carson! Extremely clean, fully furnished, 2 bedroom Condo in central Colorado Springs. 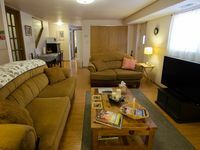 Property 15: Extremely clean, fully furnished, 2 bedroom Condo in central Colorado Springs. Property 18: Quiet, Comfortable Home. Beautiful Home in Downtown and by Colorado College. New furnishings & Clean! Apartment was nice and clean and suited our family of 4 needs for somewhere to stay after sight seeing and other activities around Colorado Springs. Living room set up had plenty of sitting room and good place to hang out at night. Would stay again...price was right too.